Landscape: A volcanic spire of bare rock-faced cliffs and tropical forest hanging over the main village. 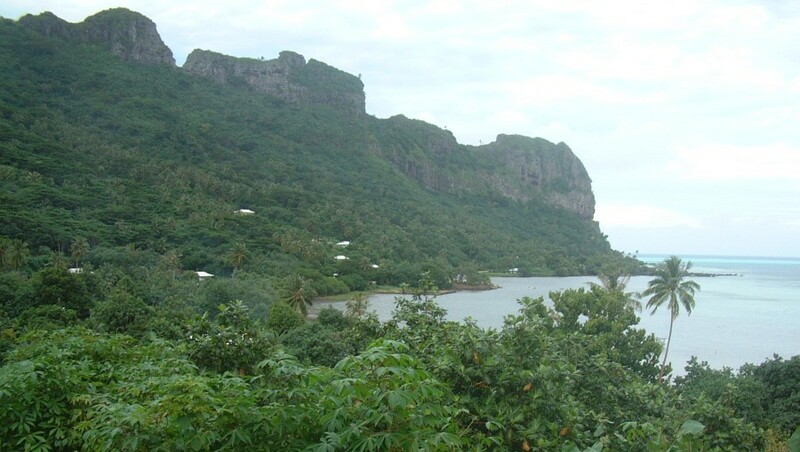 This was our last French Polynesian island before jumping off for Tonga. 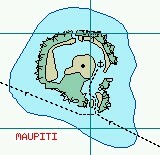 (Jon) Like most atolls, Maupiti is an old volcanic island, now surrounded by coral reef. This reef, while quite extensive, drops off quite suddenly to very deep water. Getting into (and out of) Maupiti is often quite a trick. Unfortunately, pictures from the boat just don't do it justice. There is only 1 pass for getting in or out, located in the SE corner. The pass is fairly narrow (about 200' or 60m) and rather shallow (about 25' or 8m). When swells come up from the S or even the SE, they soon start breaking, making both entering and exiting too dangerous for most boats. Since Maupiti is about 25 miles dead down-wind from Bora-Bora, you really don't want to sail all that way and then discover you can't get in. Your only options then would be to turn around and motor back upwind for 25 miles (likely arriving after dark) or continuing west for several hundred (thousand) miles. 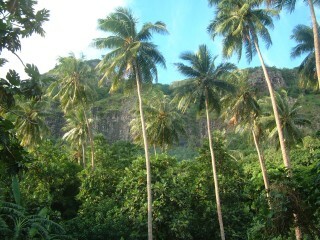 Luckily, we found a sailor in Bora-Bora whose family lives on one of the motus just next to the entrance. He simply called his mom on a cell-phone and asked her what the pass was like. She said it was calm that day, so off we went. Even so, the pass was pretty hair-raising. Reefs SE of the pass make it look like the pass is breaking, even when it isn't. Also, all the waves breaking over the reef all the way around raise the water level of the interior lagoon, so there is always a stiff current flowing out the pass. Coming in, I was glad to have 2 nice big diesel engines. When we got inside we found a Norwegian sailboat that had been trapped inside for 2 weeks because the pass was breaking. Going out was actually somewhat more thrilling, as the current generates a considerable rip that extends well out into the ocean. I quite enjoyed Maupiti. It's small enough to walk around (getting some delightful views) and the people seemed friendly. Very few yin a few hours achts stop there, so those that do get treated well. Going to their church on Sunday & listening to the singing can be especially rewarding, as the locals are likely to take you home for lunch. There's only 1 bakery and a tiny store, so one hardly needs money (a good thing, since there's no bank). (One strange thing I noticed is that virtually every house had a cemetery plot out front. This must make it hard to either buy or sell a house. What do you do with grandma?) Walking and exploring the motus is fun and rewarding. A delightful stop before heading out on a 1,400 mile passage. (Chris) I don't know if we'd initially intended to go to Maupiti, but we were cruising with another boat and they stopped into Maupiti, so we decided to follow them. Good decision! The island of Maupiti was very reminiscent of the Marquesas, with a single-street village and every yard full of beautiful trees and bushes. I really enjoyed walking the town and up a hill to a lookout over some of the surrounding motus. One thing I found interesting about Maupiti is that watermelons are a principal crop. The island is wet enough, but the motus (where the melons are grown) are dry! Still, it was interesting to walk around the islands, looking at the little houses and plantations, and searching for shells. (Amanda) Maupiti was a cute and gorgeously authentic island, though my impression was slightly modified by my first trip ashore. Mom and I were walking to the one little supermarket when this dirty old man comes out of his house in his boxers and starts saying to us "I need a woman, you know?" Ugh! It was disgusting at the time and hilariously funny back on the boat. Another thing I noticed ashore was that every single house we walked past had a number of graves in the front yard. I thought it would be weird to say hi to gramma and grampa every day as I left for school or whatever, but I guess there was no community graveyard. Surprisingly, the lagoon was extremely shallow and very murky. 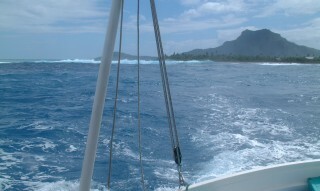 We were anchored for most the time in about 25 feet of water, and I never once saw the bottom. There were intermittent bommies that Mom and I swam over - they dropped down into the gloom and I lost them at about ten feet. Maybe it was so murky because it was so shallow? Or maybe it had something to do with the strong current through the narrow, single pass. Whatever it was, the only time I had seen a lagoon so murky was in Tahiti, right after a very long rain storm. (Sue) Maupiti's infamous pass keeps many cruising boats from entering (and if the weather and swells are bad, keeps them from leaving) so I felt lucky that we hit the conditions just right for a safe passage into the lagoon of this rarely-visited island. The cliffs above town give it a truly exotic feel, and it's small enough to be walked around in a few hours, which Jon and I did one late afternoon. We found good shelling on the motu beach to the east of the lagoon, but the mosquitoes and no-see-ums were fierce in the afternoon. On the main island apparently the bugs are not a problem, but on the motus where watermelons are cultivated there is standing water from the irrigation and the bugs multiply. 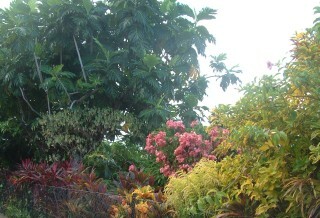 This was a lovely send-off island from French Polynesia.